The Claymore GPU miner for CryptoNight crypto coins is designed to be used on AMD-based video cards, especially for the latest generations such as Radeon 280X and 7970. Do note that this miner is available only as a Windows binary and there is no source code that you can compile yourself, so you need to use the version compiled by the author of the miner software and it is only available for 64-bit Windows, no Linux support is available. Also note that the software has 5% developer fee built into the miner software, meaning that it will mine in a developer preset pool for 1 round out of 20. The software supports failover pools and you can also set the specific GPU id if you do not want to use all of the available video cards to mine with it. 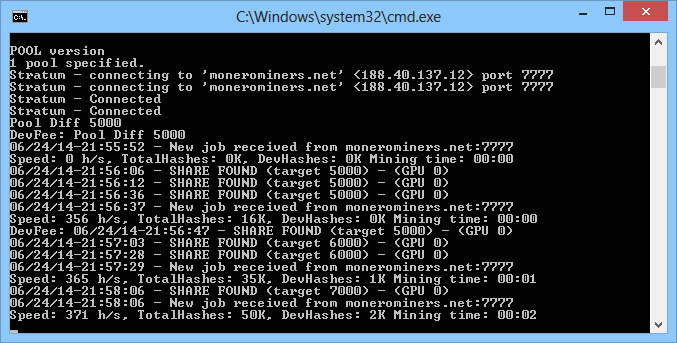 We have tested the latest version 3.4 of the miner on a Radeon R9 280X GPU and are getting about 390 H/s in terms of hashrate.